Home Headlines Infinity GM Screen & Code Infinity Release! 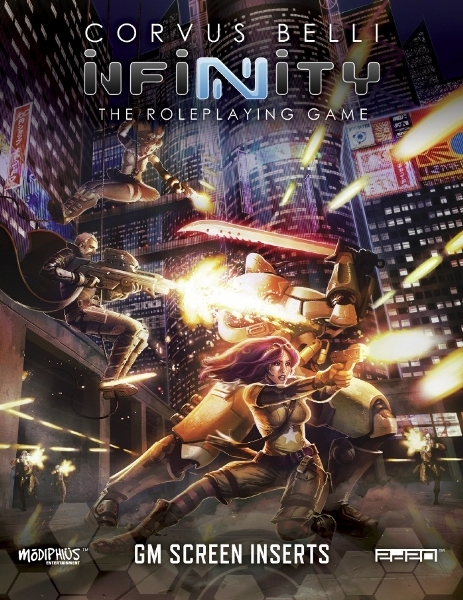 Today we’re really pleased to announce the release of the Infinity GM Screen + Code Infinity package in PDF, to help you continue your adventures in the Human Sphere. The Infinity GM Screen + Code Infinity package is available on Modiphius.net and DriveThruRPG.com and here’s the exciting details. A four-panel PDF screen that presents action-packed artwork to the players. of Mirrors objectives, and unique villains. their wisdom and glory to the Human Sphere. We hope you enjoy this latest release and look out for more great Infinity books coming soon!